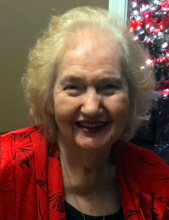 Mrs. Velma Joan Cobb, 86, of Barnesville, passed away Wednesday, April 3, 2019, at her home. Mrs. Cobb was born December 24, 1932, in Cleveland, Ohio, daughter of the late Harry Green Rice and Blonnie Belle Overfield Rice. She retired after serving as a real estate agent for more than fifty years and was associated with Deed Realty in Michigan for many years. She had made her home in Barnesville since 2015. Survivors include her daughter and son in-law, Thresia and Richard Goodrich of Barnesville; son and daughter in-law, Wayne and Thresia Cobb of Clarkston, Michigan; grandchildren, Frank Cobb and his wife Amanda Cobb, Jontel Lidman and her husband Daniel Lidman, Antonio Kildani, Tristan Goodrich, Erienne Goodrich; and great-grandchildren, Kyley Cobb, Hayley Cobb, Kayley Cobb, Joseph Rogers, and a great-grandson to arrive in July. The funeral service will be conducted at 4:00 p.m., Sunday, April 7, at Rock Springs Church in Milner, with the Rev. Taylor McNeely officiating. Interment will be in Loveless Chapel Cemetery in Salem, KY on Saturday, April 13. The family will receive friends at Rock Springs Church from 2 until 4 Sunday afternoon. To send flowers or a remembrance gift to the family of Velma Joan Cobb, please visit our Tribute Store. "Email Address" would like to share the life celebration of Velma Joan Cobb. Click on the "link" to go to share a favorite memory or leave a condolence message for the family.